^ ا ب "BBC – Religions – Christianity: All Hallows' Eve"۔ برطانوی نشریاتی ادارہ۔ مورخہ 7 جنوری 2019 کو اصل سے آرکائیو شدہ۔ اخذ شدہ بتاریخ 1 نومبر 2011۔ All Hallows' Eve falls on 31st اکتوبر each year, and is the day before All Hallows' Day, also known as All Saints' Day in the Christian calendar. The Church traditionally held a vigil on All Hallows' Eve when worshippers would prepare themselves with prayers and fasting prior to the feast day itself. 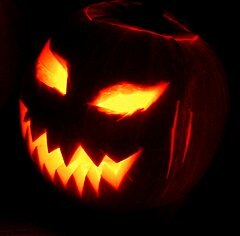 The name derives from the Old English 'hallowed' meaning holy or sanctified and is now usually contracted to the more familiar word Hallowe'en. ↑ The Book of Occasional Services 2003۔ Church Publishing, Inc.۔ مورخہ 7 جنوری 2019 کو اصل سے آرکائیو شدہ۔ اخذ شدہ بتاریخ 31 اکتوبر 2011۔ Service for All Hallows' Eve: This service may be used on the evening of اکتوبر 31, known as All Hallows' Eve. Suitable festivities and entertainments may take place before or after this service, and a visit may be made to a cemetery or burial place. ↑ Anne E. Kitch۔ The Anglican Family Prayer Book۔ Church Publishing, Inc.۔ مورخہ 7 جنوری 2019 کو اصل سے آرکائیو شدہ۔ اخذ شدہ بتاریخ 31 اکتوبر 2011۔ All Hallow's Eve, which later became known as Halloween, is celebrated on the night before All Saints' Day, نومبر 1. Use this simple prayer service in conjunction with Halloween festivities to mark the Christian roots of this festival. ↑ The Paulist Liturgy Planning Guide۔ Paulist Press۔ مورخہ 7 جنوری 2019 کو اصل سے آرکائیو شدہ۔ اخذ شدہ بتاریخ 31 اکتوبر 2011۔ Rather than compete, liturgy planners would do well to consider ways of including children in the celebration of these vigil Masses. For example, children might be encouraged to wear Halloween costumes representing their سرپرست بزرگ or their favorite saint, clearly adding a new level of meaning to the Halloween celebrations and the celebration of All Saints' Day.